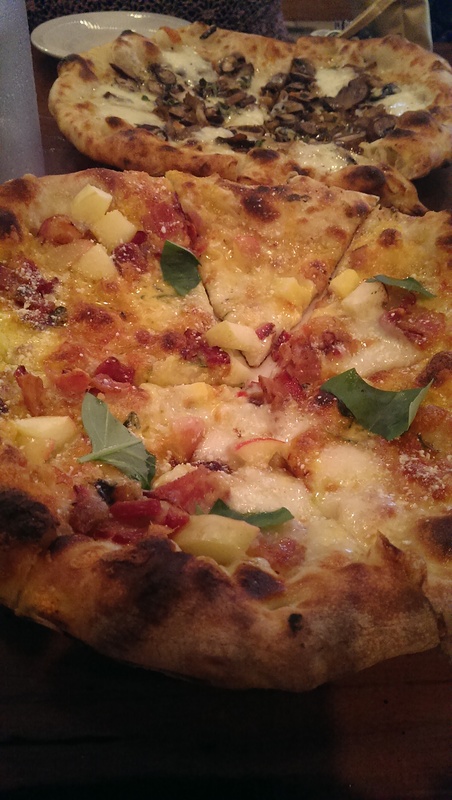 If you are a regular follower of this blog, you know that I fell in love with Neapolitan pizza while studying abroad. I had been hearing lots of good things about Biga in Kirtland, and I am happy to report that everything I heard is true. 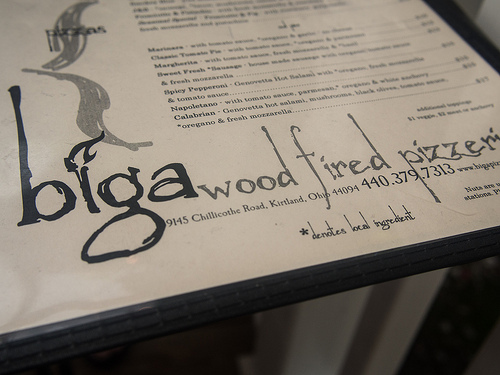 Biga is a family-run pizzeria, so they have limited business hours. It is only open Thursday, Friday and Saturday from 5-10 PM and Sunday from 4-8 PM. The restaurant features wood-fired pizza, generous salads and humongous (and delectable) desserts and focuses on locally sourced ingredients. The place is small, so reservations are recommended. They also do not offer takeout on Friday and Saturdays from 6:30-8:30 PM. They do not have a liquor license, but you can bring your own beer or wine for a $2 corkage fee. The crust is hands down the best of the best here in Cleveland. Since it is fired in a wood-burning oven the crust is going to be a little charred in places. If this bothers you don’t go here. If, however, you think the char adds flavor to the crust you will be very happy here. That said, I have never had a “burnt” crust here. The chefs are very conscientious. For my first visit I met six friends here. This group likes to share, so I was able to try just about everything. 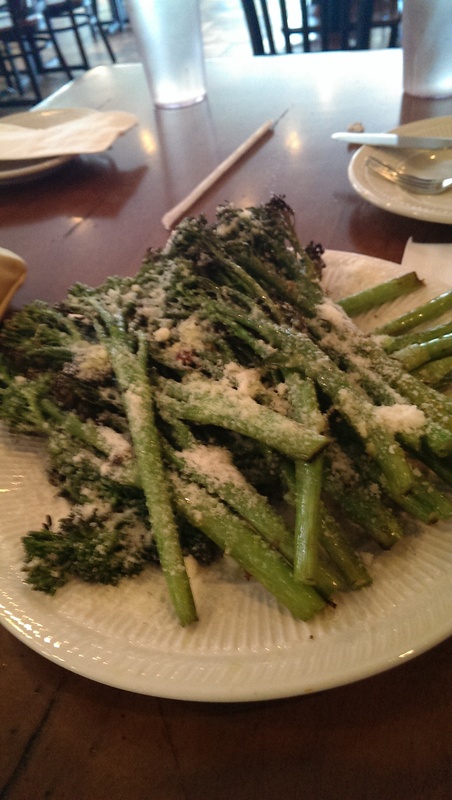 We started off ordering the broccolini, which was an immense mound of broccolini covered in garlic and parmesan cheese. We all had some and still had leftovers. One of my friends and I also ordered the Crispy Salad, featuring locally-grown butter crunch lettuce, Sage Apple Farm’s Fuji apples, crisp celery, toasted walnuts and Gorgonzola cheese. It was a good salad, but huge. Three or four people could easily split one. 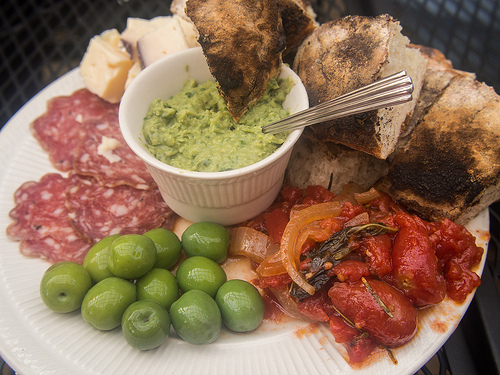 Another absolute stand-out was the antipasto, which features wood-roasted tomatoes, fresh sliced salume, Castelvetrano olives, herb pesto dip and cheese served with wood-fired bread. The tomatoes and herb pesto were to die for – you could tell the ingredients were fresh! I had ordered the J&B pizza, which is a white pizza featuring “house-made sausage, Barb and Patty’s Butcher Palace’s bacon, mushrooms, onions and fresh mozzarella cheese.” Other pizzas ordered by our table included the Rustica (a white pizza featuring fresh artichokes, onions and Kalamata olives, garnished with locally-grown oregano, Parmesan cheese and mozzarella cheese), the Wild Mushroom (another white pizza with wild-harvested roasted mushrooms, locally-grown oregano and fresh mozzarella cheese), a Daily Special (which featured fresh corn and bacon and was delicious), and the Special Seasonal Pizza, which was a prosciutto and fig pizza. They were all outstanding, but my hands-down favorite was the Sweet Sausage Pizza, which is a red pizza featuring sweet sausage, locally-grown oregano, made-in-house tomato sauce and fresh mozzarella cheese). I liked it so much I went back a week later and ordered it. 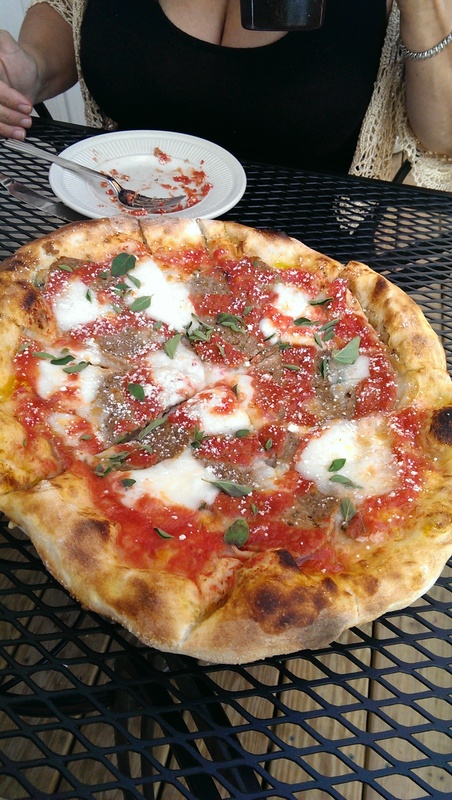 That visit I met a girlfriend for dinner, and we ordered the Homemade Meatballs as an appetizer and split the pizza. 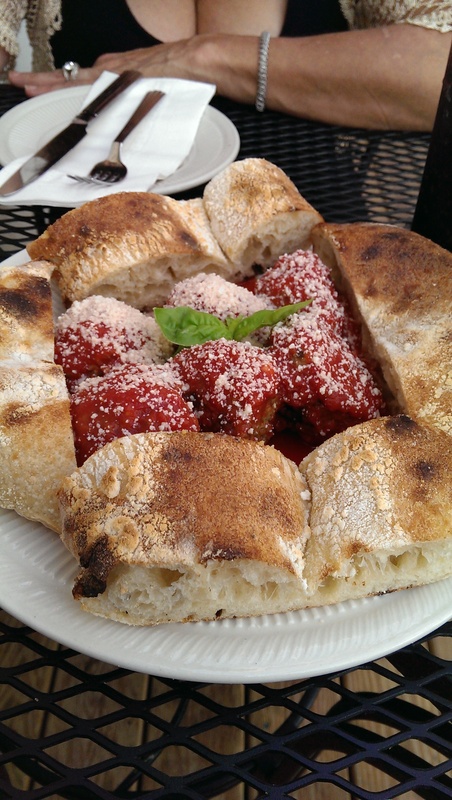 The meatballs were soft and flavorful and were surrounded by a ring of wood-fired bread. The pizza was just as good as I remembered. 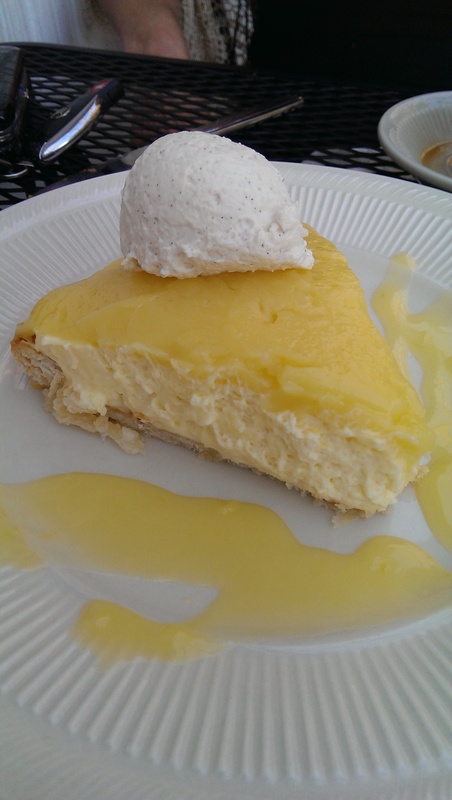 We also ordered the seasonal lemon tart, which we only intended to have two bites of and leave but found it to be so delicious that we couldn’t stop eating it and finished it off. It was absolutely delicious. On subsequent visits I have enjoyed the Smokey Blue Pizza (wild mushrooms, hand-crafted prosciutto, smoked blue cheese and mozzarella cheese – without the prosciutto) and a seasonal pizza with Sage Apple Farm’s honeycrisp apples, Barb and Patty’s Butcher Palace’s flavorful bacon and cheddar cheese, garnished with locally-grown rosemary. I have never been disappointed with any of the food here. 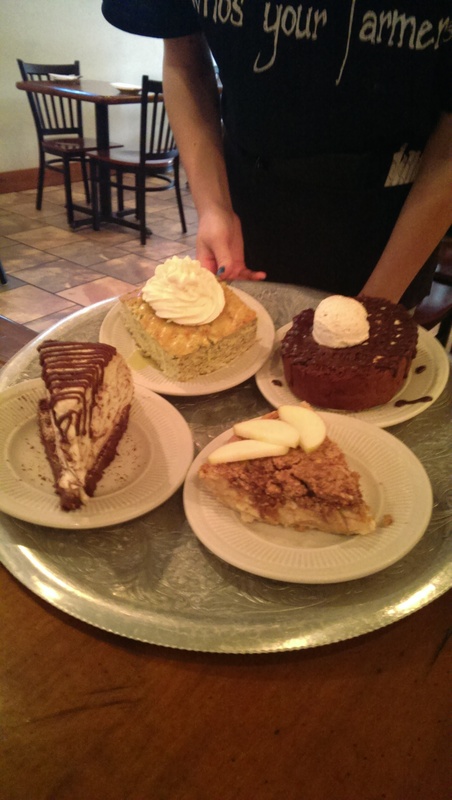 The desserts are HUGE! They are all homemade in-house. We ordered several and passed them around the first visit. I ordered the Ho-Ho, which is a huge cylindrical, chocolate-frosted, Bailey’s cream-filled cake. The Bomb is an ice cream cake swirled with Nutella. The version that night was featuring fresh blueberry sauce swirled in along with the Nutella. It truly was the bomb! But the desserts should definitely be shared. 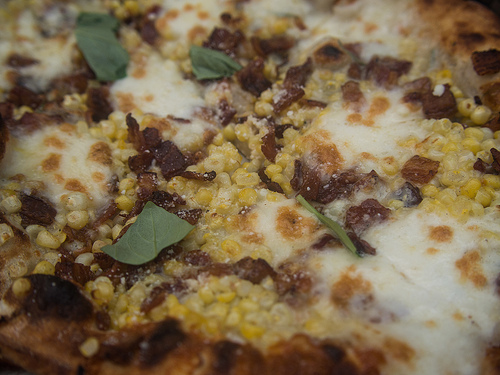 A note about the photos: I left my phone/camera in the car on my first visit, so the photos of the menu, antipasto, and corn & bacon pizza (basically the artful square photos) are from my friend Edsel L’s Flickr account. Be sure to check out his other photos from that visit! They will make your mouth water – even the salad photo! i also recommend the Biga donuts. its a desert of about 12-15 square pieces of their pizza crust with powdered sugar on it, served with a large bowl of warm nutella. it is by far my favorite desert they offer.